Tomas De Bruyne from Belgium is one of the most sought after and respected international floral designer today. Tomas (co-) published over 15 books. He has presented and reached audiences at every corner of the continents with his talent and knowledge. Tomas has also been published in more than 60 magazines worldwide. Along with giving seminars and demonstrations he has been commissioned to work on many prestigious projects world-wide. 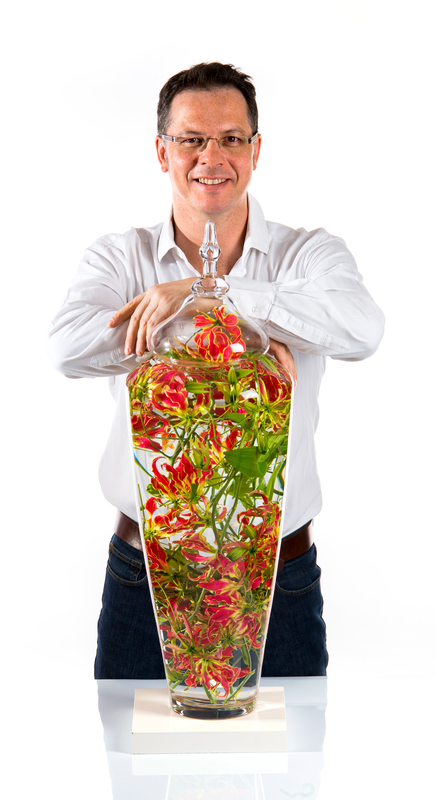 In 2013, a new variety of Gloriosa lily was officially named after Tomas De Bruyne. He provides tailor made and high quality floral experiences worldwide. Can you live from your art? Do you consider yourself already a professional artist? Yes definitely. During the many years I have worked with flowers and natural materials, I have developed and grown into a different person. Flowers do that with people: they throw you back into yourself and upon what really matters. What steps did you take to generate income with your art? And what was the most important one, your breakthrough? I started to develop my own method of educating students the techniques of high level floral art and made a certification for the successful students which is now internationally renowned. Secondly I focused myself to share my expertise on the high-end event market worldwide. Traveling to other continents, experiencing and learning from other people’s ancient cultures and histories has helped me to master my skills. My first major step was believing in myself to invest in the creation of my own book. What steps do you plan to take to become a professional artist able to live from art? And how do you plan to grow and archive new goals? To merge the ‘left’ and ‘right’ brain 😉 To create an openness to delegate and work with staff. Working ON my company / skills / passion instead of IN. Tomas, what are the biggest dangers/threats/challenges on the way to become a professional artist, able to live from art? What can others learn from your experience? Being your own bottleneck is a danger. You can’t grow for ever without expanding man power. Know yourself, your expertise as well your weaknesses before hiring staff. What are the most effective tools and/or services, to promote/market yourself? Which ones helped you and which ones were a waste of time? What I do is the most effective marketing tool and service! My clients are my ambassadors. Beside this the word of mouth and customer satisfaction are the best promotors. I never spend lots of money in advertising. How important do you think is the traditional art-market (galleries, shows, fairs, museums, critics, curators) in becoming a professional artist being able to live from art? Important. Today it is more an AND-AND-AND story. By and-and-and I mean you have to present in galleries, shows, fairs, social media, etc. to create some visibility. How important is online/social-media, e-commerce etc. in becoming a career artist, and why do you think that? Very important. As long as you control and use social media carefully and know how to play, it serves you well. What advise do you have for artists that aim to make a full-time living from art? Commitment, believe in yourself and your service / product, perseverance, knowledge and experience. Where/How should artists start when they aim to become professionals and build their career? What are/were your first steps? Start with education; knowledge helps a lot. The cost of not being educated is higher than the investment of learning your skill by a mentor o school. What initial steps should artists definitely avoid, in your experience and opinion? Go for a combined strategy, an online and offline marketing. What do you think the people expect from art nowadays? What would they like to see? Do you care? They don’t want to only to look at art, they want and emotional experience, feeling part of it with their whole mind. What is your view on today’s art-world and/or art-market? What would you like to see different? Do you think it’s more easy for artists nowadays? Be different! Art is the barometer of manliness which changes continuously. Anything else you would like to say to our community of artists and art-lovers worldwide, any final advice? Article: (c) Source Picture Vocation for Art Article: Follow your heart, work hard, believe in yourself and never give up At NOENGA™ Vocation for Art they interview art-professionals/businesses worldwide and when they find great value and inspiration in these interviews, they publish them.